coconut rice pudding with roasted cherries + a giveaway! I've been chatting with some of you about what kind of recipes are helpful to you, and it sounds like we are all very busy people. Too busy. Too busy to make breakfast, too busy to make lunch, and too busy (and tired) to come home and make dinner. With that in mind, I am trying to include more recipes for busy people so that they can eat homemade + healthy more often. Starting with breakfast. 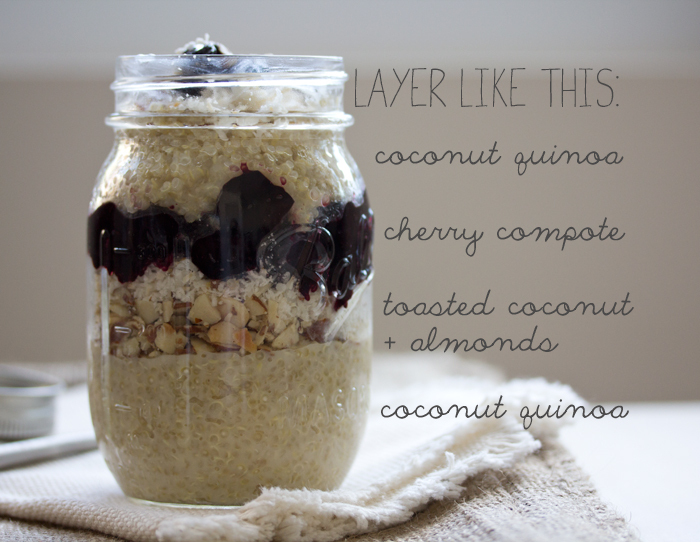 My great pal, nutritionist, and fellow health enthusiast, Tiffany, asked for an easy recipe for breakfast on the go. This one right here might take a little effort up front, but it can be made ahead of time and it will last you a good couple of days. As you would expect, it is dairy-free and gluten-free and oh-so delicious. 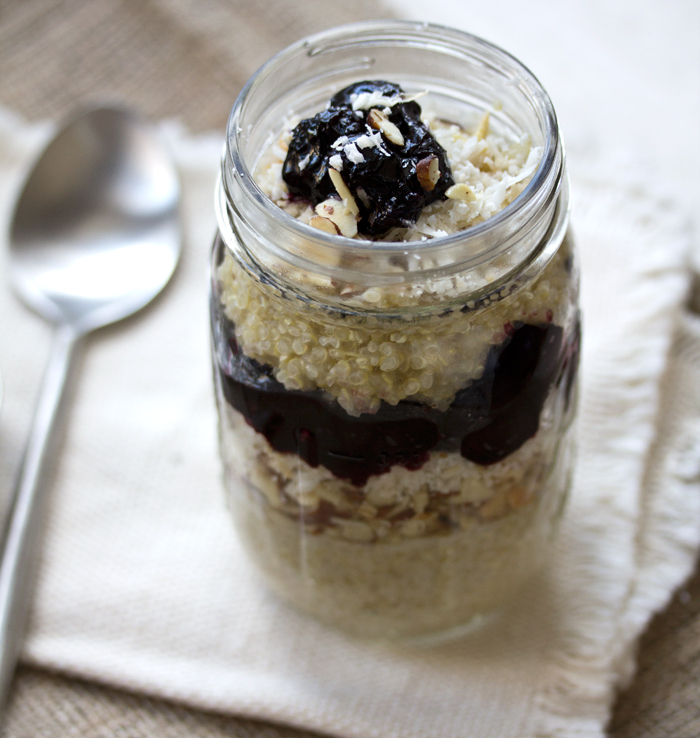 Making your breakfast the night or weekend before and putting it in a jar is a great way for you to be able to enjoy a lovely homemade breakfast on the go. Getting into the habit of making breakfast or lunch for yourself at least a few days a week is just one little thing you can do to improve your overall health + might even put a smile on your face. News flash! You can put anything in a jar and take it with you, not just this recipe. Oatmeal + raisins, muesli + fruit, or maybe even a little yogurt parfait. All you need is 30 or so minutes on a Sunday afternoon, and you have breakfast ready to go for a few days out of your week. 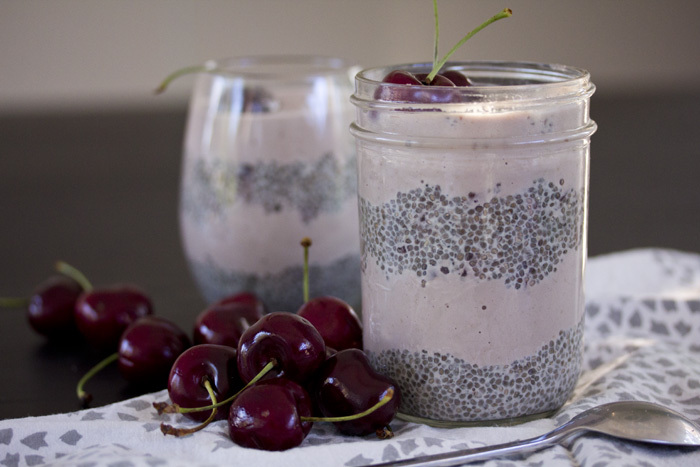 If you do not own a mason jars, you can also make this in whichever travel container you like to use. I love mason jars (who doesn't). They serve so many purposes. The tight lids also offer extra insurance if you are traveling with your breakfast so that you do not end up with it all over your car or handbag. Now, of course, if you do not have an office job and you just want to make this for yourself or your boyfriend / husband / girlfriend / stranger, by all means. This recipe is great for that too.